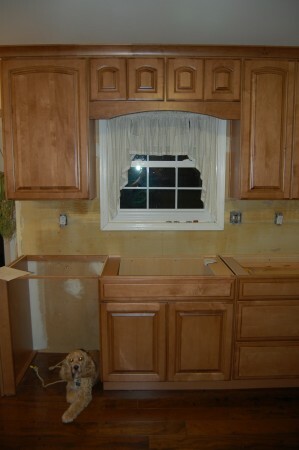 The cabinets are installed! Oh what a difference a day makes. 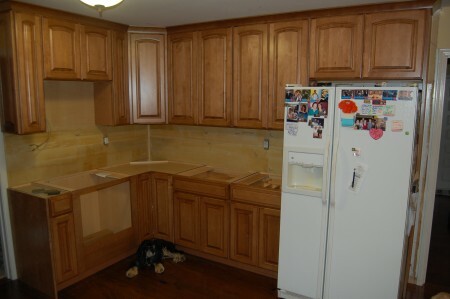 The installers did a good job too! I only had to fix two drawers… so far. First, they installed the silverware tray backwards and they decided to omit the screws for the track in the towkick drawer. But all is well now, and all that is left to do is patch holes in the drywall, pick out a countertop and appliances, install said appliances, find a new home for everything in the kitchen, finish the hardwood floor, install new baseboards, pick out new cabinet hardware and faucet fixtures, install hardware, pick out a backsplash and install it, re-plumb the sink, garbage disposal, and dishwasher, re-wire an over sink light, install a plug for the microwave, plumb the vent hood, and paint. Yessir, we’re at the home stretch now.